Sometimes, we have to pinch ourselves around here. 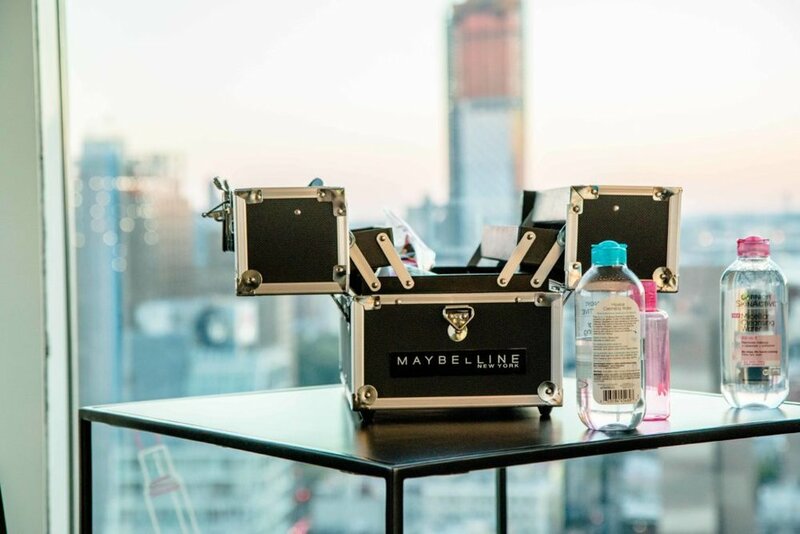 Last year, we were honored to be part of the behind the scenes execution of a truly spectacular event for the Global Maybelline It Girl influencers in the Hamptons. Last week...we got to do it all over again! This time, the girls were in NYC and we couldn't have been happier to be a part of this year's activation. The events were kicking off on Halloween in the penthouse at the Hotel Indigo on the Lower East Side. 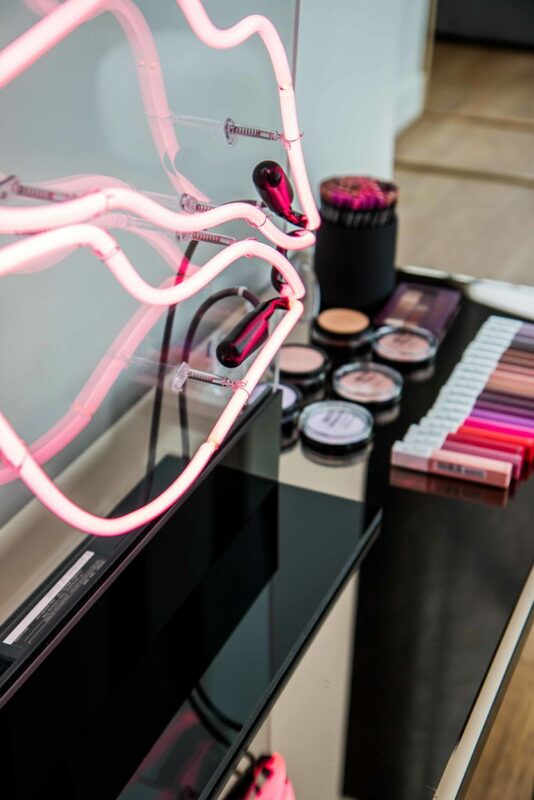 We took creative reign to transform the space with branding, custom decor and Halloween themed items that we sourced to display all of the make up that Maybelline was promoting. 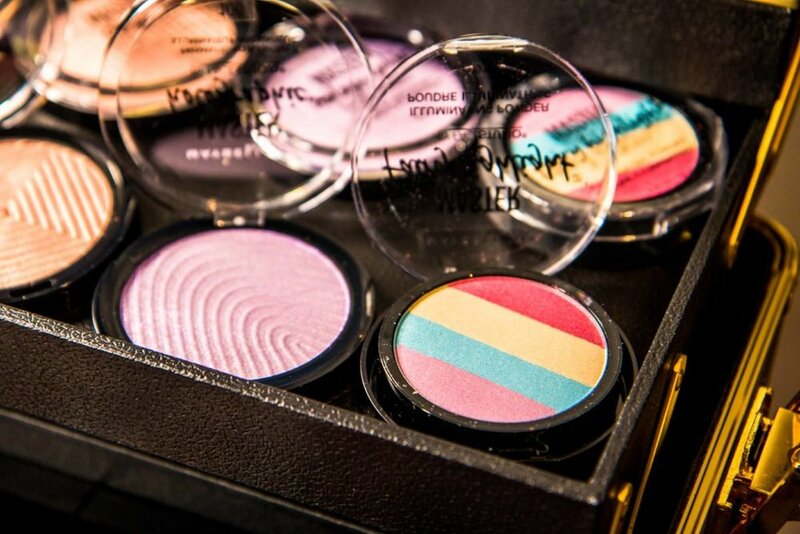 Maybelline worked with artist Brian Kaspr to create custom logos for the event. We worked these logos into decals, neon signage and Maggie used the icons to create a custom design for art on the wall in the penthouse that we took over as our home base for the events. We found every opportunity in the penthouse for branding such as the coffee table that you could look down on from the balcony above. You know how much we love arranging flowers around here. The color palette for this event was one of our absolute favorites. Specifically for Halloween we mixed millennial pinks with deep red and green. The other task we had was to find unique items for decor and make up display. The black python candle holders were from Target and I got just eat their heads they are so cute. The cement vessels were from CB2 and are so chic in real life. Then there were the custom metallic fringe letter props that we had Confetti System make for us. The girls used these in their photos in the penthouse and on the balcony with the panoramic NYC views. We thought it would be fun to style some of the flowers into black skull candy jars giving an unexpected, spooky look to one of the make up station tables. Now this is my favorite... When we were pitching our ideas for decor we wanted to bring in the incredible Oh Joy for Target round barcart. I guess last year they had it in pink and this year it's in green. Well we didn't realize the pink cart was from last year. We thought we could buy it for this event. When we made this realization we had to think fast so what did we do? We called on Crafty Maggie to paint the green cart and make it pink + black. Does it get more fabulous than this? I don't think so! The girls were due to arrive at the penthouse on Halloween night at 7pm. The sun was setting and the neon lights were glowing through the windows, the space was party perfect. When the girls arrived in the space they were welcomed with specialty cocktails made with dry ice spooky and festive for Halloween night. There was candy and make up styled all over the space available for the girls to experience first hand. On the upstairs floor the girls were invited to get pampered with make up, hair styling, halloween accessories like headbands, cat ears, fangs and flower crowns that Natalie created custom for this event. 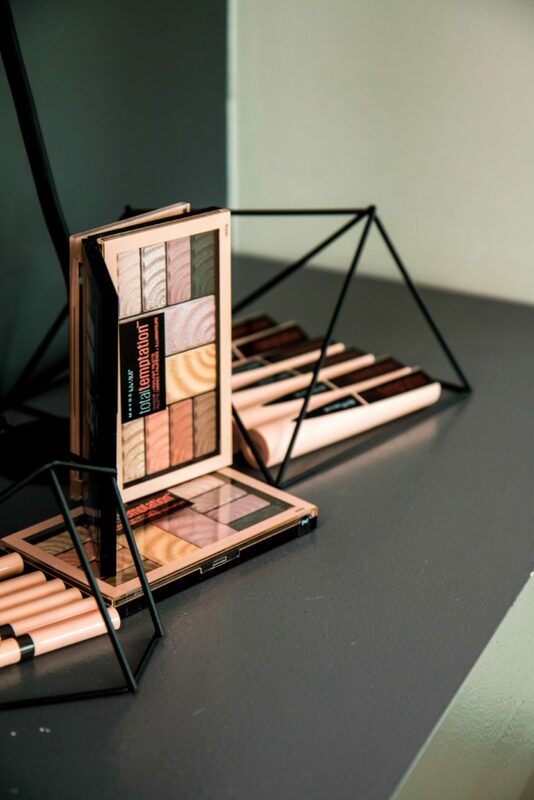 The day after Halloween, the Maybelline It Girls were back in the penthouse which we have changed over to a feminine while modern look of florals, make up display and furniture for the girls to enjoy breakfast, pampering and lounging. 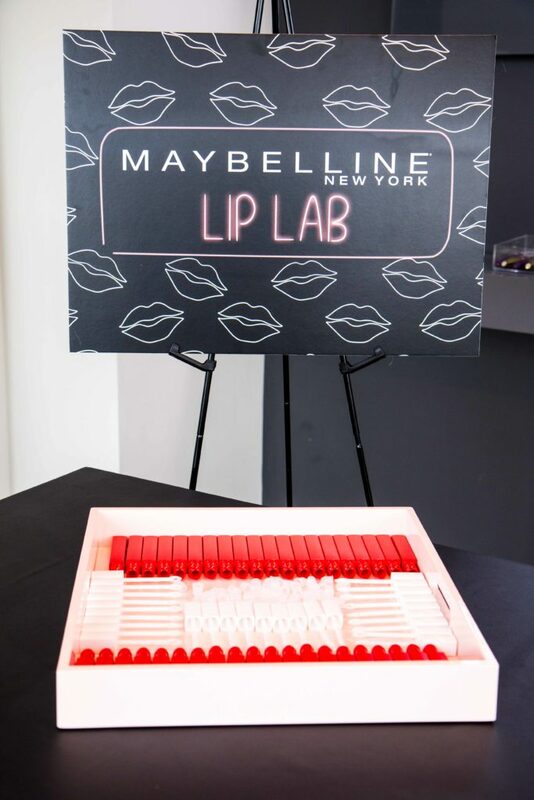 There were several activities planned for the girls while they were in the penthouse such as lip lab where they had the opportunity to create their very own lipstick! As well as Essie manicures, massages and hair blow outs. There was beautiful and delicious food at all times, provided by the team at Mr. Purple that is the hot spot bar and restaurant in the hotel. One of the activities the girls got to participate in was making their own sweatshirts with Bow & Drape. I own one of these sweatshirts and am obsessed. They are so soft and cosy. How fun would it be to design your own?! The week's events were a hit and the girls had a blast and we were so honored to be a part of the creative execution for all of it.